In this blog entry, Sportista co-author Andy Markovits considers how women have become a significant fanbase at sporting events and how they have attained virtual parity with men. NBC’s viewership for the London Olympics was nothing short of amazing. On a number of evenings, around 30 million Americans tuned in to watch this global event. At least half of these viewers were women. With our Olympic team featuring more female than male athletes for the first time in history; and with the former winning a majority of the medals (including gold); women seem to have arrived on sports scene, until recently a decidedly male domain. But how will this phenomenon carry over into the just-commencing college football and NFL seasons and does it have any bearing on the pennant races in MLB that are about to heat up across the land? 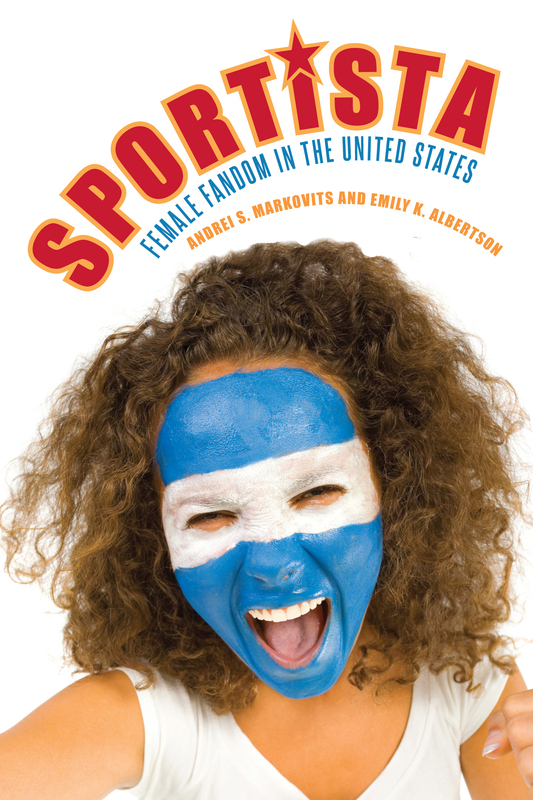 Our book Sportisa: Female Fandom in the United States sheds some light on precisely these questions. We argue that on sports’ production side – meaning the world of athletes – women have attained virtual parity with men. Almost solely due to the immense changes wrought by Title IX and the political, social and cultural atmosphere that gave rise to it; women’s success in having made their presence as sports producers totally ordinary is quite amazing, especially considering where things stood nary three decades ago. But “doing” sports and “following” them are two (almost entirely) different things. And we found that women follow sports differently than men. Still fewer in numbers, women that follow sports love their teams, know their players, despair over a loss, rejoice with a win; in short appear to exhibit all the fan-like characteristics that men have displayed since the late 19th century. But rare is still the woman who revels in spouting obscure statistics pertaining to all of the North American Big Four sports past and present; who knows line ups of teams which she has never seen and which might not even exist any longer; who, in short, is a sports omnivore to whom knowledge of (usually team) sports is at least as important as passion for them; and to whom performing such sports may actually be irrelevant (possibly even counterproductive) to their loving and following them. But such women exist as well, and in increasing numbers by the day. We chose to call them “sportistas” analogous to “fashionistas” denoting a person who not only loves fashion but is also profoundly knowledgeable about it. Thus, our sportista loves her sports and also knows them. Alas, neither of these attributes suffices for her to be seen as an equal to her much more numerous male counterparts. Men continue to regard sports as their own domain where women are little more than tolerated intruders. They may learn the stuff, know it well, but somehow will remain outsiders, tolerated to be sure, but not seen as truly authentic. To be sure, a rare group of women attain such authenticity – and thus full acceptance and membership in the club – after having passed countless non-specific but very real “tests” that men place in their path by constantly raising an ill-defined bar. As we argue at our book’s end, women have come to learn the language of sports perfectly, but they will continue to speak it with an accent that may not even be discernible to them, but remain all the more so to men. Thus, while women have come to follow events like the Olympics, the Super Bowl, the World Series and others outwardly just like men, the two genders’ involvement in the quotidian manifestations of the few team sports that constitute what we have termed “hegemonic sports culture” – meaning the Big Four of baseball, football, basketball and ice hockey in the United States; ice hockey in Canada; soccer in Europe and Latin America; cricket and various rugby codes in South Africa, Australia and New Zealand – remains well apart. Thus, in the next few months of this post-Olympic period, women will passionately follow their favorite NFL team, root for their college team, and hope that their baseball team wins the pennant and the World Series. But the way they will do so, and the deeper meaning of this activity, will be quite different from that of men’s. Andrei S. Markovits is Arthur F. Thurnau Professor and the Karl W. Deutsch Collegiate Professor of Comparative Politics and German Studies at the University of Michigan. He has published prolifically on German and European politics, and sports. His latest book is Gaming the World: How Sports Are Reshaping Global Politics and Culture.